Russian lawmakers now have an opportunity to convince Prime Minister Dmitry Medvedev to review his “zero per mil” stance on regulating drunk driving. This is a key issue for the bill that aims to introduce tougher drunk-driving penalties. A few days before work concluded on the bill for toughening drunk-driving penalties, Duma deputies made headway on the question of what exactly constitutes being drunk behind the wheel a vehicle. 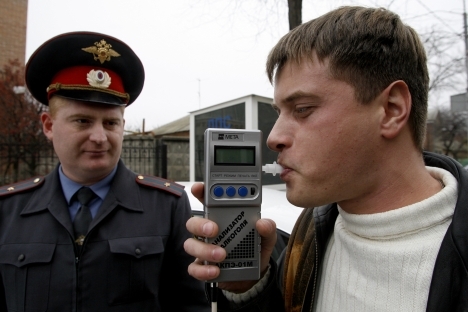 Dmitry Medvedev is all for a zero-tolerance policy on the issue: anyone with a blood alcohol content (BAC) above zero percent per milliliter is liable for drunk driving. During a meeting with the Prime Minister, the authors of the new bill were able to soften Dmitry Medvedev's previously rigid stance on the issue. The prime minister is absolutely against any law that would introduce an acceptable maximum BAC of 0.20, and insists that the threshold should be zero. Medvedev initially introduced the “dry law” for drivers and signed it two years ago, when he was president. In early October, at a meeting that took place behind closed doors, Medvedev maintained his previous position and announced that he was willing to change his point of view and introduce a new norm if the authors of the amendments could convince him that the step is necessary. He made it very clear that any softening of the legislation should not be seen as a green light for those who are tempted to drive when under the influence. First Deputy Chairman of the State Duma Committee for Constitutional Legislation and State Construction, Vyacheslav Lysakov, who presented this bill to the Prime Minister, spoke to RBK Daily about the matter. “[Medvedev] said that he will stand by his opinion because, in his view, as soon as they start making concessions on the zero BAC rule, people who want to drink and drive will carry on as normal, hoping to get away with it. But the prime minister did add that he is ready to review the situation if we are able to prove him wrong,” said Lysakov. He also said the anti-zero policy has the support of leading Russian specialists who are ready to support their position with studies that have been conducted internationally and in Russia. “For example, a dry law is in place in Sweden, where the maximum BAC is 0.20 for drivers,” said Lysakov. “There was a movement stirring to bring the limit to zero, but scientists proved this to be unwise.” The politician went on to explain that, when establishing the highest permissible level, some margin for error need to be left for the breath testing process; endogenous alcohols also need to be borne in mind, for cases when a person was not drinking before he got into the driver’s seat, but still tests positive. The authors of the amendments believe it is absolutely vital to formalize the “intoxication criteria” in the legislation, now that punishments are harsher. It is suggested that a differentiated penalty scale will be introduced depending on the level of intoxication – from community service to three-year prison sentences. While discussing these amendments in the State Duma, many deputies and a representative of the Ministry of Internal Affairs proposed introducing penalties that would involve the offender’s car being confiscated, but these never went through. However, lawmakers found another way of depriving offenders of their cars. “We are going to look into alternative punishments, such as confiscating the vehicle if the offender does not pay the fine,” said Lysakov. Duma deputies literally have a few days to complete these amendments, as work needs to be concluded by Wednesday for the legislation to be published. It is very possible that a detailed explanatory note will be added to the legislation, affirming that a person is only officially over the limit if his or her BAC is over 0.20. The story is based on the reports from Newsru.com, RBC Daily and Kommersant FM. "Once penalties have been toughened the situation is bound to improve! All over the world people have been brought up to know that you cannot drive a car unless you are sober, and punishments are harsh for those who choose not to listen. It is time for us to introduce the same standards. These are fundamental rules that have been written with the blood of thousands of victims who have died unnecessarily as a result of someone’s alcoholism and/or stupidity. I think the law will be passed before New Year. And then drivers will finally become more disciplined." "First and foremost, we need to be very clear as to what constitutes a state of intoxication. Because, as it seems to me, this zero BAC policy is over the top. We have had a lot of comments from people saying that they have never drunk in their lives, but the breathalyser still picks up on alcohol in their blood. There are various innocent explanations for this – they could be on medication, or they might regularly eat buttermilk, for example, this can all influence a person’s BAC. So the most important thing is to establish what exactly constitutes being ‘under the influence’, and toughen the penalties for being drunk in charge of a vehicle." “Fines are not enough to put people off. People who drive cars are generally not short of money, and they will be able to pay their way out of trouble. What is a hundred thousand roubles to one of them? The harshest degree of criminal responsibility needs to be introduced, and I think a lifetime driving ban should also be introduced for drunk drivers”.